I have spoken about Post-LKY era in several occasions over the last few years and I have just done that on the day Mrs. Lee Kuan Yew died, 9 September 2010. When I heard that news, it immediately struck upon me that we are walking right into Post-LKY without any adequate preparation at all. The loss of his beloved wife at this ripe old age of 87 would have great impact on his health and well being, especially so when he has just been admitted into hospital for chest infections. When I watch him speak at his wife's funeral, reading his eulogy painfully with a barely audible voice and head facing down most of the time, I suddenly felt very sorry for him. The once one of the best political orators in this region, has suddenly lost his flare and magical touch. The severely wounded old lion may not roar again. I still hope that he would have a speedy recovery from both his illness and grief. Someone has a lively discussion with me about Post-LKY era and declare that "LKY doesn't matter at all". I said, "But the fact that we are using LKY as the indication in Post-LKY era discussions truly reflects the fact that his political life is an important part of Singapore's history!" 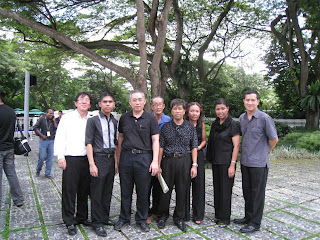 Although Mr. Lee Kuan Yew is still alive, but death to everyone, including all of us, is certain, just a matter of when. With due respect to MM Lee, for the benefits of Singapore, we will have to examine all the possibilities carefully so that we could prepare ourselves, the Nation, for a smooth transition into Post-LKY era. 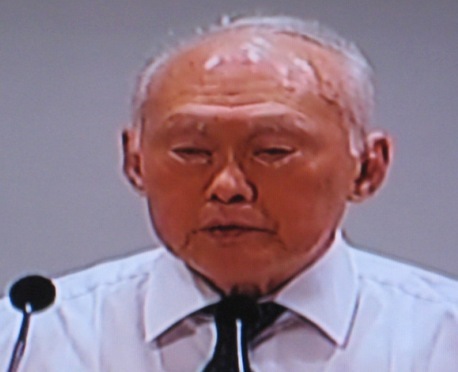 1) Will LKY's legacy outlive his passing? 2) Can the present social-economic-political model sustain in the long run? 3) Will there be power struggle within PAP? If so, will political instability occur? 4) Will both foreign and local investors maintain their confidence in our country's stability? 5) Will Singapore's political hegemony continue to strive? The ultimate question is, will Singapore be better or worse off without Mr Lee Kuan Yew and how could we maintain or develop our political system thereafter? In human history, particularly Chinese ancient and modern history, the passing of an Emperor or a political Strongman will always trigger off power struggle within the system. eg. The death of Chairman Mao Zhe Tong is the prime example how the power vacuum leads to intense power struggle. Luckily for China, Chairman Mao during his last breaths, has done the right thing of reinstating Deng Xiao Peng so that the Gang of Four could not extend their political atrocities by capturing power. In Singapore's context, one may think that all is fine since Mr Lee Hsien Loong has become the third generation Prime Minister in Singapore. However, from all observations made so far, the undercurrent of power struggle is quite eminent. It is only natural for any organizations to have different cliques or factions, especially so for political parties no matter how big or small they are. The most important thing is to find the balance whereby all factions could compromise and work together for the bigger picture. However, when there is a change in the dynamics between the factions due to the diminishing or total absence of a strongman like MM Lee, it will initiate fresh round of struggle to find the new balance of interests and power among them. Whether we like it or not, such realignment of power balance will take place. In my opinion, for the sake of the country, Mr. Lee Kuan Yew should retire from active politics in either the form of total withdrawal from contest for the coming GE or just become a backbencher. This is to allow the Nation and all social, political and economic sectors to get used to a system without Strongman LKY. We need such gradual transitional period to cushion off the impact of the uncertainties arise from Post-LKY era. Post-LKY era will pose great challenges as well as opportunities for the country as a whole. Post-LKY era will practically mean the end of strongman politics in Singapore. Many countries in the world have gone through such transition. eg. Korea, Taiwan, Philippines, Indonesia, Malaysia and even China etc. The common phenomenon of Strongman politics in many countries during last century is basically due to the Post War impact whereby strong leadership is needed for the initial phase of stability, recovery and rebuilding from the devastating effects of World War II and the political uncertainty imposed by Cold War. However, most of the countries have walked out of the need of Strongman politics and many of them are working towards a more open and democratic political system. Whether Singapore will follow the footsteps of these countries in embarking on the journey of developing a more open and democratic political system suitable for Singapore's context will depend largely on voters, not merely the ruling party alone. It is a world trend for such political transition to happen because the model of political hegemony is NOT SUSTAINABLE in the long run. We should ensure the transition from Strongman politics to democratic development to be in a controlled and smooth manner. Concurrently, we should reexamine on the kinds of political models we want for Post-LKY era. This should be done with the interests of our future generations instead of the usual narrowly defined interests of the ruling party. MM Lee has once said that if the "opposition party" wins the elections twice consecutively, Singapore will be doomed. The basic reason why he comes to that conclusion is that the present political system is designed in such a way that a lot of power has been CENTRALIZED to give the ruling party absolute control. There is practically little SEPARATION of POWER to talk about, least, any meaningful checks and balance system. It is basically a system that is designed to entrenched the system of power hegemony. However, MM Lee may have forgotten that the main threat of "dooming" Singapore may not come from any opposition party winning the elections but rather a corrupt group of politicians evolving out of PAP itself! The PAP may be seen as relatively clean by world standards but NOBODY can guarantee that this will forever be so and PAP will never be led by corrupt leaders in future! I really hope that we will not face turbulent time ahead in Post-LKY era. If that happens, it would also mean that Mr Lee Kuan Yew has failed to build a sustainable system that could outlive his own legacy. There is still time, no matter how little it is, for MM Lee to do what is right for Singapore. MM Lee should initiate and oversee the fundamentals of a better and more democratic political system to be established before he retires from Singapore politics. Nobody else in PAP has such political clout to do it except him. He should institutionalize the independence of the Elections Department and fair play in our elections. 1) Gerrymandering and pork barrel politics should be outlawed. 2) A form of Proportional Representation should be adopted. 3) Independence of the press and government establishments like People's Association should be established. 4) All political parties should be given equal access to Government resources and funding to enhance healthy competition. 5) Political Donations Act should be amended to allow political parties to solicit funds. 6) Freedom of speech should be further institutionalized so that political parties or politicians could air their views freely in the context of public interests. 7) Freedom of information access to government statistics and data should be made available for enhancing political debates. 8) Intimidation or use of coercion on political opponents through government agencies, institutions or GLCs should be outlawed. No one should be intimidated or persecuted for his political beliefs and involvement. There may be more things to be done but it would be a good start with the above mentioned. There is an urgency for him to do so else Singapore will fall and become the victim of intense power struggle within his own party after his passing. That would be a sad Post-LKY era the entire Nation will face in time to come. I pay a visit to the Wake of Mrs. Lee Kuan Yew today with a few party colleagues including Steve Chia and Nor Lella to offer my deepest condolences and sympathy to Mr. Lee Kuan Yew, Prime Minister Lee Hsien Loong and their families. I have given a short statement to Radio 95.8 on the importance of the support of a capable spouse, a soul mate for people who are involved in politics and public service. The lonely road on pursuing our political dreams will be much bearable with the support of our soul mates in our lives. I am fortunate to have my soul mate who has provided strong moral support all these years and I empathize the great grief of MM Lee losing his soul mate. My sympathy and condolences to him and wishing him speedy recovery from his present illness. The following is a very good report written by Donaldson Tan of News Asia Republic on the Elections Forum organized by SFD. “A team building process cannot be based on a common enemy. 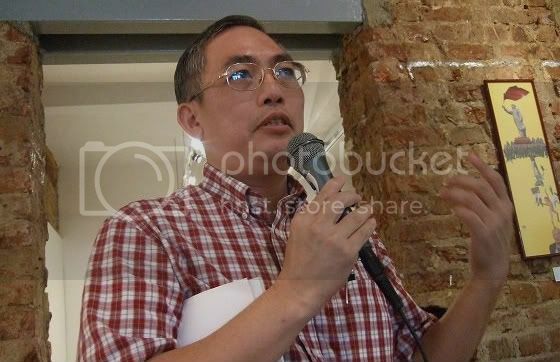 It is not sustainable over the long term, ” Mr Goh Meng Seng told participants at a public workshop on electoral reform organised by Singaporeans For Democracy (SFD). “What will happen [to Opposition unity] when LKY dies or when PAP looses half its support?” This reply was a response to a question from the floor on Opposition unity. Mr Goh is the Secretary-General of the National Solidarity Party (NSP) and a panelist at the workshop. The 40-year-old politician was elected to the top post at NSP this February. He told participants that PAP practises confrontational politics because of its historical baggage with colonialism and communism. As such, it is not unusual for PAP to treat Opposition politicians as troublemakers. This mindset is not sustainable. “You must first believe that the Opposition is part of the government, but plays a different role,” Mr Goh told the participants. The ‘troublemaker’ mindset is evident in the Political Donation Act. Total anonymous donation to political parties cannot exceed S$5,000 a year. This limit is hardly enough to cover a year’s rent of office space for the political party. To make matters worse, the Singapore Land Authority does not permit residential spaces (e.g. HDB flat) to be used for conducting political activities. Yet, MPs can rent void deck space of HDB flats for political outreach. Moreover, PAP MPs enjoy a discount when they rent the HDB void deck space through the People’s Association. This constraints political competition in Singapore. Mr Goh pointed out that political competition is good for the state. This is why political parties in Hong Kong and Taiwan enjoy state funding as long as the parties can win votes above a particular threshold. Perhaps Singapore should do the same to allow the current political system to be more balanced. Political parties are agent of change, but change still must come from the electorate. The electorate has to believe in fairness in the political system. In Singapore, the elected MP is not given funds to set up an office in his constituency. In Hong Kong, the elected representatives and town councillors receive state funding to pay for the office rent and staff salaries for the operation of his office. In comparison, Singapore is very primitive. Opposition MPs have to meet their constituents in the HDB void deck. Certain constituents require privacy when meeting their MP but this is not possible if the Opposition MP has no office space. Mr Goh also shared his concern that Prime Minister Lee Hsien Loong had refused to call for by-election in response to the news that Dr Balaji Sadasivan, a MP of the Ang Mo Kio GRC, had passed away from Colon Cancer. The Prime Minister’s rationale is that the remaining MPs in the same GRC can take on his roles and responsibilities. Mr Goh pointed out that a MP has 2 roles: (1) serve the constituents; and (2) debate in parliament. “How can anyone simply replaces another MP to debate in parliament?” he said. He opined that the problem of by-election can be circumvented by proportional representation. In proportional representation, by-election can be circumvented more fairly as it allows the party to internally select a new representative to take over the vacated MP post. While it may not be fair to aspiring MPs who are alive, proportional representation is more inclusive. For example, proportional representation allows LGBT interest to become an election agenda, unlike the current situation, whereby first-past-the-post system restricts General Election candidates to campaign along mainstream issues. After all, LGBT members are still members of society. Mr Goh also raised another concern relating to the GRC – race politics. The Election Department requires the certification of race of General Election candidates of minority race. This certification is not permanent. It is only valid for one General Election, so candidates have to be re-certified at every General Election. “Does your race change over time” asked Mr Goh. According to Mr Goh, the reason for the certification of minority race is to inform PAP how many wards the Opposition will be contesting. The Election Department reports to the Prime Minister’s Office. Moreover, it creates the perception among minority race candidates that the opposition political parties need them because of their race and not their individual merits such as integrity and political acumen. Last but not least, Mr Goh touched on the conduct of General Election by the Elections Department. He noted that Singapore does not have a fixed date for General Election, thus there is no incentive for the Elections Department to release periodically a report on electoral boundaries. The Elections Department does not brief partisan players on electoral procedures. This includes issues such as what counts as a voided vote and how votes are counted. The Elections Department needs to beef up in this aspect. The Elections Department is also in charge of venue booking during General Election campaign period. Rallies are important for opposition parties as they are the only means for an Opposition political party to access masses during the campaign period. “Singapore has a very primitive way for the Opposition to book rally venues. People has to start queuing up the night before [outside the Elections Department],” said Mr Goh. Online booking of venues is so prevalent today. Mr Goh noted that the ruling party benefits from the current set-up as it can easily mobilise a lot of people to queue, unlike any of the Opposition political parties. There were 2 other panelists – Mr Chia Li Tik (Secretary-General of the Socialist Front) and Dr James Gomez (Executive Director of SFD). Film maker Martyn See was the workshop moderator. The workshop, titled SFD Election Consultation, was held at Post Museum on 2 Oct 2010 (Saturday) from 1500 to 1800. There were 50 participants in total. The 3 panelists had campaigned together as candidates under the Workers’ Party in the 2001 General Election. I will touch on mainly three aspects of the electoral system here.